Japanese people call each meal "gohan" which usually indicates steamed rice. For example, breakfast is called "asa-gohan." A bowl of steamed rice is included in typical Japanese meals. Side dishes are called okazu and are served with rice and soup. Rice is a staple of the Japanese diet. Rice cakes (mochi) are also commonly consumed. Traditional Japanese breakfast consists of steamed rice, miso (soybean paste) soup, and side dishes, such as grilled fish, tamagoyaki (rolled omelet), pickles, nori (dried seaweed), natto, and so on. Various rice bowls and noodle dishes are popular for lunch. For example, ramen, soba, udon, gyudon beef bowls are popular. 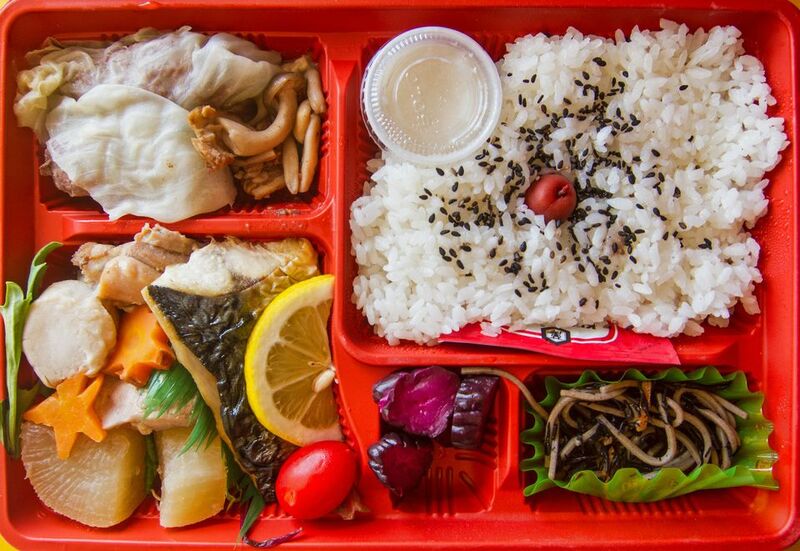 Many people take bento lunch boxes to school or work. Dinner is usually the main meal of the day. Modern Japanese dishes are highly influenced by other Asian and Western cuisines. Besides rice, seafood is highly consumed in Japan since the country is surrounded by oceans. Seaweed, fish, clams, fish cakes are popular ingredients in Japanese cooking. Dashi soup stock used in traditional dishes is made from katsuobushi (dried bonito flakes) and/or kombu (kelp). Essential seasonings are soy sauce, mirin, and miso. Japanese people distinguish traditional Japanese-style dishes as "wa-shoku" (wa means Japanese-style, and shoku indicates food) as opposed to Western food, which is generally called "yo-shoku." Chinese dishes are called "chuuka," and chuuka dishes cooked in Japan are arranged in Japanese-style. It's similar to authentic Chinese dishes but has its differences. Japan is a small country, but each region or even a city has its own specials. Mainly, there are Kanto region (eastern area of the main island) food and Kansai region (western area of the main island) food. Generally, Kanto food has strong flavors, and Kansai food is lightly seasoned. Many dishes are cooked differently between the Kansai and Kanto regions. To eat Japanese-style meals, chopsticks are commonly used. Also, Japanese people use forks, knives, or spoons, depending on what types of food people are eating. The traditional Japanese table setting is to place a bowl of rice on your left and to place a bowl of miso soup on your right side on the table. Other dishes are set behind these bowls. Chopsticks are placed on a chopstick holder in front of rice and soup bowls.